Relapse Prevention - Moral Reconation Therapy - MRT® distributed exclusively by Correctional Counseling, Inc.Moral Reconation Therapy – MRT® distributed exclusively by Correctional Counseling, Inc. Relapse Prevention - Moral Reconation Therapy - MRT® distributed exclusively by Correctional Counseling, Inc. The relapse prevention program, Staying Quit, targets individuals who are active in substance abuse programs of any type in any setting. Relapse prevention is the primary goal of treatment, but focusing on relapse prevention issues should take place sometime after the client is engaged in treatment and is not actively using substances. The relapse prevention materials are used in many settings, including behavioral health providers, substance use disorder programs, hospitals, and criminal justice settings, among a variety of other settings. Staying Quit helps you and your client understand which situations and people may trigger a relapse. 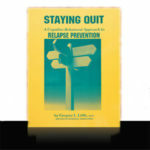 The relapse prevention programming offers a client workbook, facilitator’s guide, and supplemental materials. 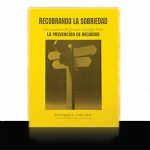 The workbook has eight modules completed in eight group sessions, supplemented by several sessions with a counselor or facilitator. Clients complete homework for each module prior to coming to the group session. During the group, clients present their homework to the group and the facilitator passes the client to the next module — or directs the client redo the homework based on objective criteria. The relapse prevention groups are open-ended, meaning that new clients can enter an ongoing group at any time. Each group session usually has new clients, as well as some finishing the program. MRT training is not required to purchase and use this workbook. The facilitator’s guide gives basic instructions and explains the criteria used for each module. 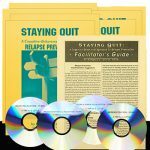 Staying Quit Group Starter Kit, Spanish workbook and Audio CD are also available.